If you enjoy soaking in a tub after a long, tiring day, then you’ll want the experience to be a restful one. 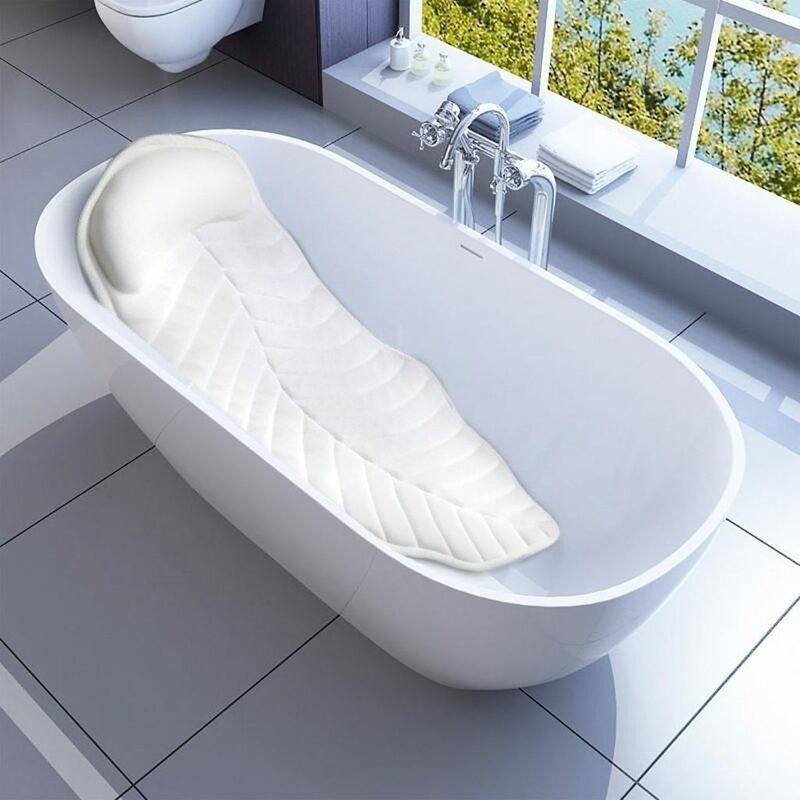 This is where a quality bath pillow can take your bath to the next level. This is an ergonomic bathroom accessory that brings comfort and relaxation to the experience without any of the annoying neck-cricking that people often experience without the right level of support for their neck or back. 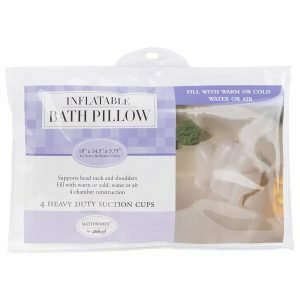 Since there are so many options to choose from, you will need to keep a few things in mind when looking for the best bath pillow. For instance, along with design considerations, you will also need to look closely at the size that you choose, the number and quality of the suction cups attached to the unit, as well as the type of material used in the pillow’s construction. If you don’t get these right, you may end up with something uncomfortable and subpar that may even increase the chance of hurting yourself in the bath. To prevent all this and much more, we have compiled a list and comprehensive reviews of the best products in the market. Our experts concluded that the products featured here are top notch and highly reliable. And to help you with your final decision before purchasing a bath pillow, we have included a buying guide to answer any questions you may have. So read on to look at the best products available and find one that will make your bath a relaxing one. 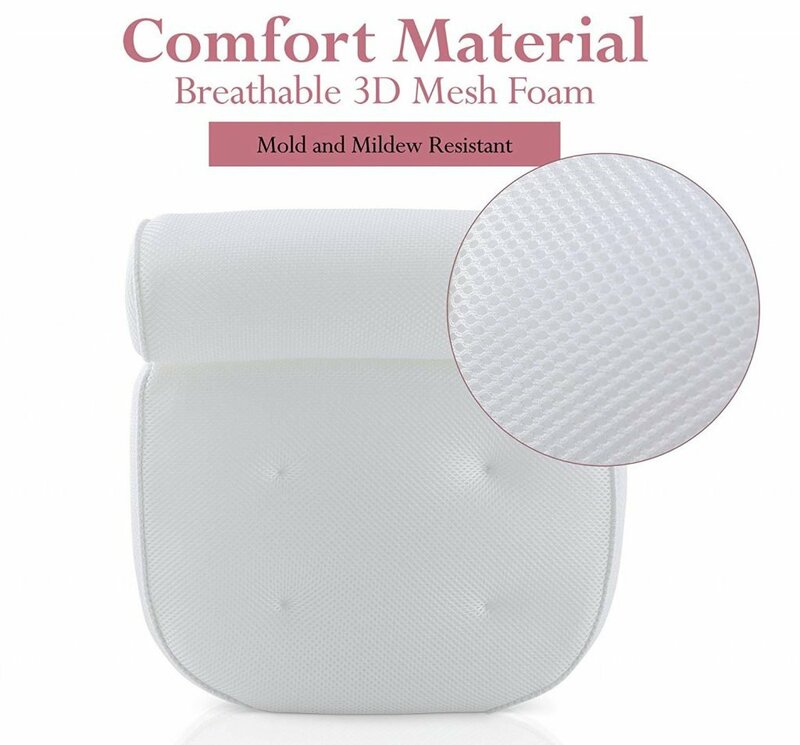 Boasting 3D air mesh technology, this is an extremely breathable bathtub pillow that won’t succumb to mold, mildew or bacteria easily. The 3D mesh permits smooth air circulation giving you exceptional body cooling. 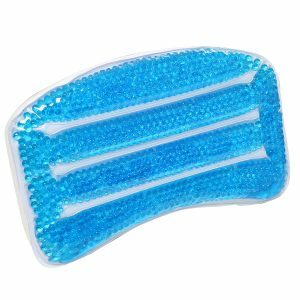 Its ergonomic design incorporates stress relief points so that any aching or sore muscles can get a gentle massage as you soak. 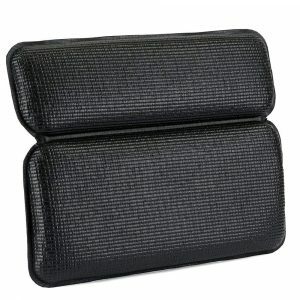 The pillow provides luxurious cushioning that creates a comfortable support against any hard bathtub walls. It contours to your shoulders, neck and back with the head resting at a relaxed angle. 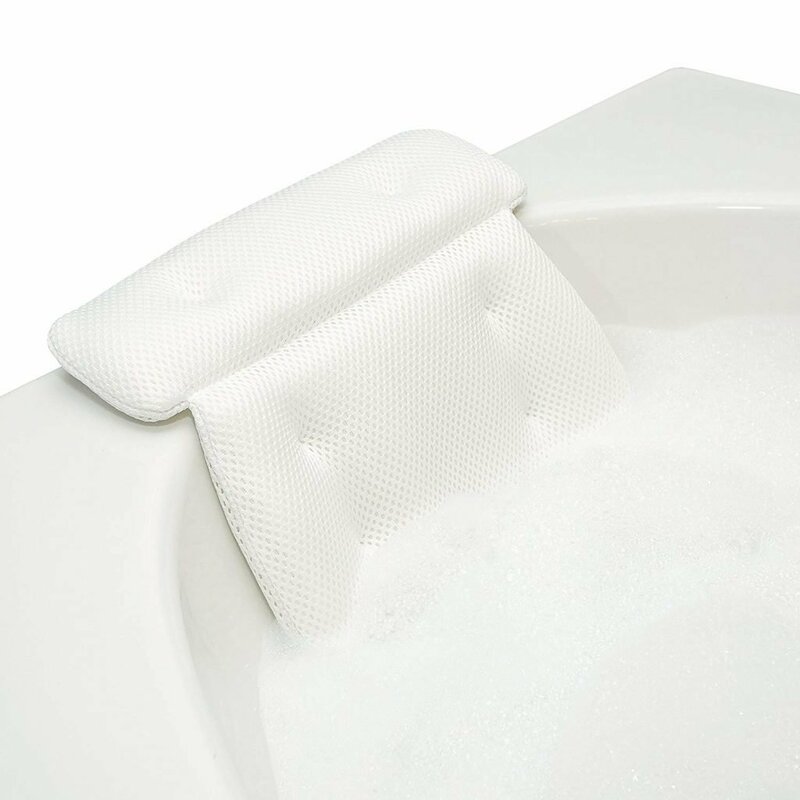 To ensure not only a relaxing but also safe experience, this bath pillow is equipped with six super strong suction cups to hold it in place. 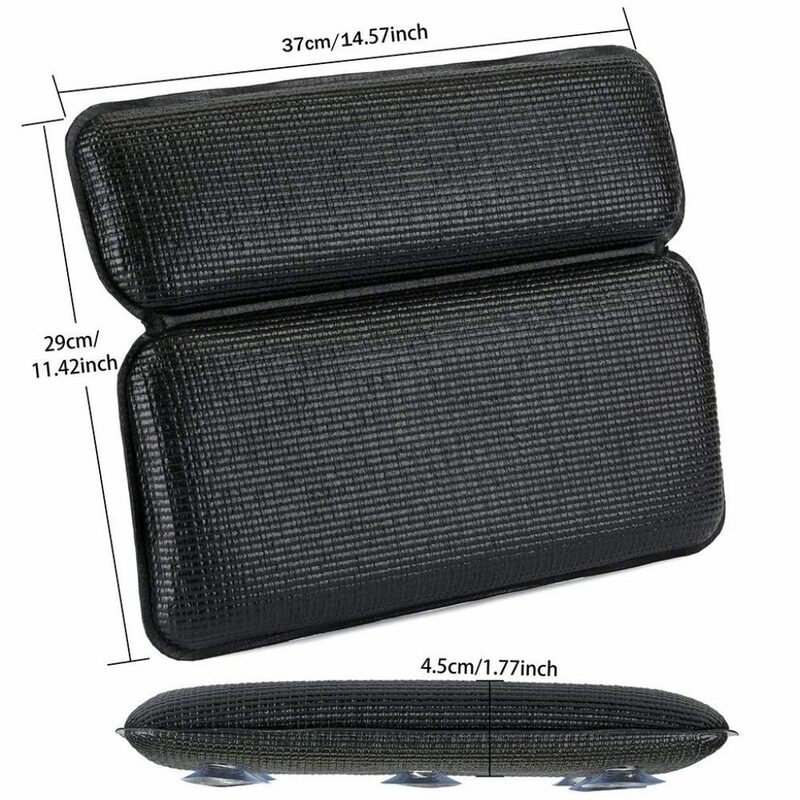 The firm grip ensures that the pillow holds on securely to the bathtub walls, eliminating any movement. The mesh weave in the construction offers durability along with quick draining and fast drying properties. To facilitate clean up and maintenance, this product is machine washable. It includes a mesh washing bag which makes cleaning a cinch. Simply pop the pillow in the bag and place in the washing machine. This prevents any damage to the suction cups or the material getting snagged. It seems that with this bath pillow, the manufacturers have thought of everything and that is why it ranks as the Editor’s Choice on our list today. With this Viventive purchase, you not only get an impressive bathtub cushion but one that is paired with an equally impressive caddy tray. The bathtub pillow features an ergonomic design that counters to your upper body for a restful experience. The super thick cushioning that yields 4 inches of support to the head and 2 inches to the shoulders and back is the ultimate in convenience, support and comfort. 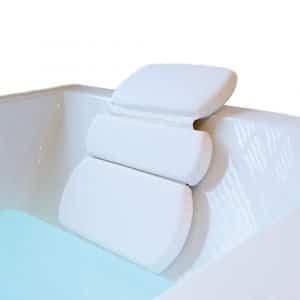 Another attractive feature of this spa bath pillow is that it has a universal tub fit. 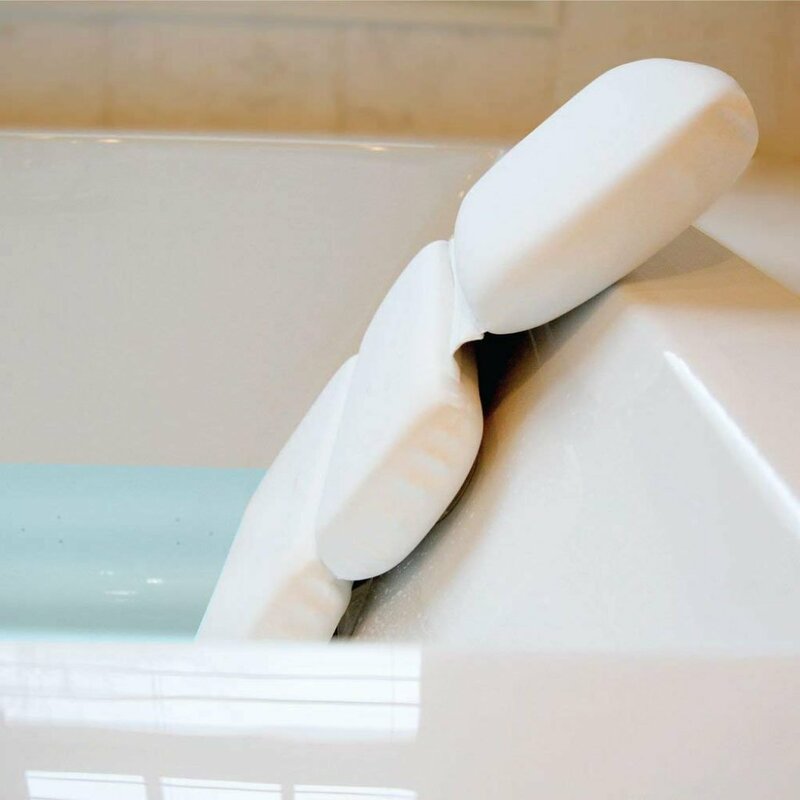 Regardless of the shape of your bathtub, you can be sure that the Viventive pillow will fit in snugly and securely. The materials used for its construction are antibacterial which prevent buildup of mold or mildew. 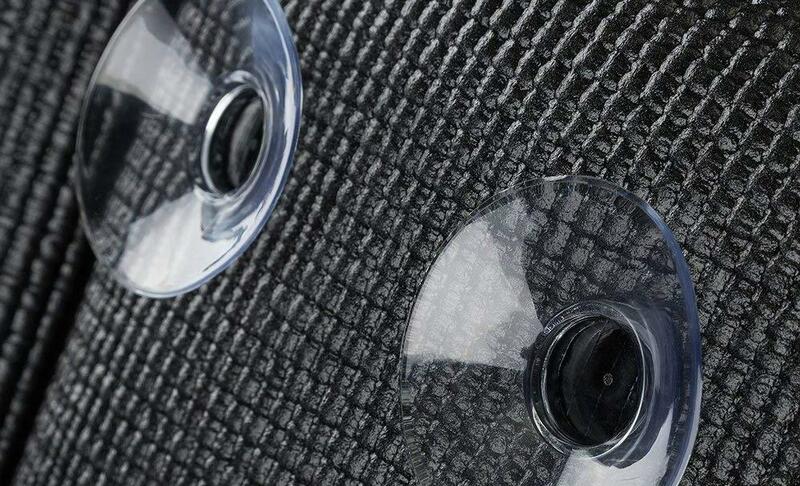 The mesh construction lends the pillow breathability and optimal air flow. The same also makes for quick and effective drying. 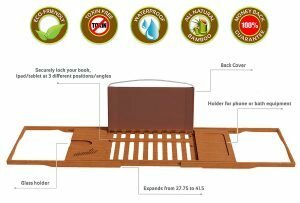 What sets this product on our list apart from the others is that it is featured as a bundle with a handy bamboo bath caddy tray, multiplied by two! So you get two of everything for the ultimate relaxation experience. 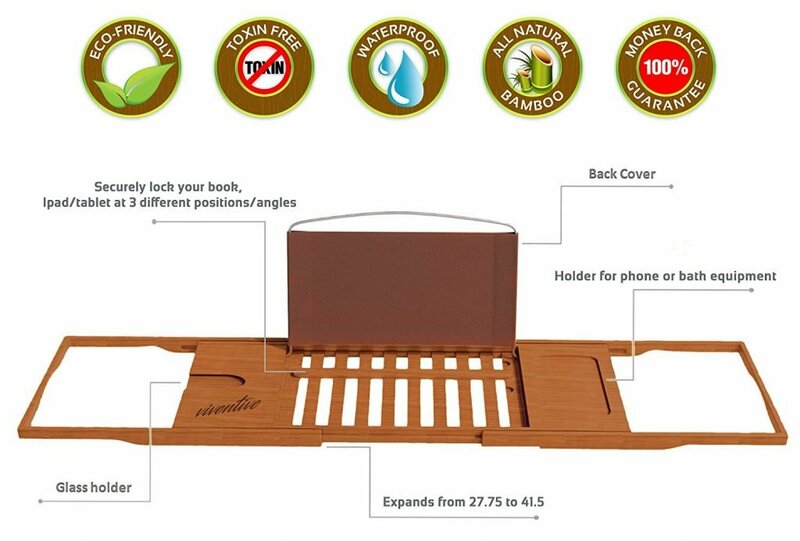 The tray doubles as reading tray, securely holding your book/s, iPad or other device with three adjustable positions to read at a comfortable angle. 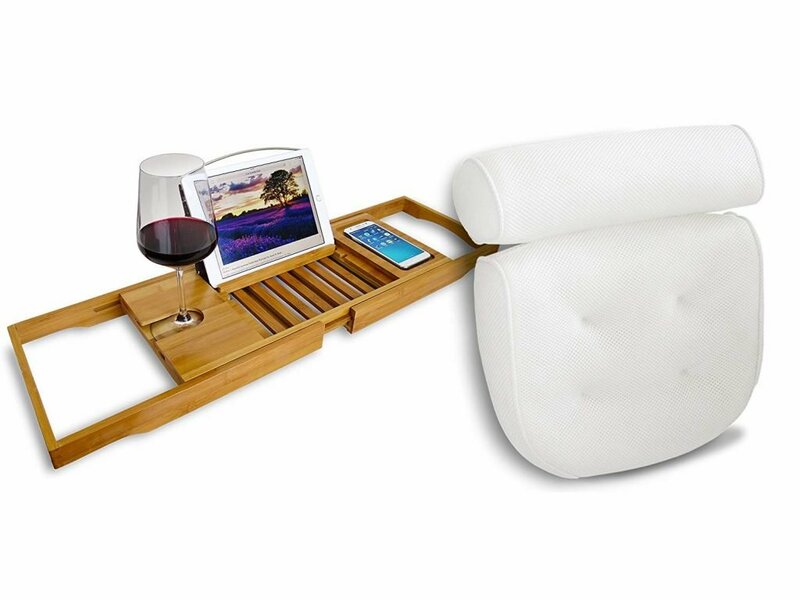 It also works well as a tub caddy where you can place your favorite tea, coffee or wine. 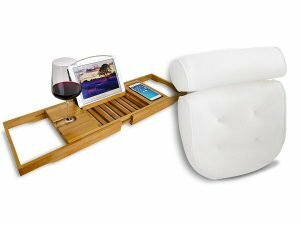 There is a built-in wine glass holder to hold your drink and you can also place your other bath accessories such as manicure supplies, facemasks, scented candles or essential oils to complete your bath experience. With such a comprehensive package to boast, it is no wonder that this is our Best Relaxing Spa Set on the list. 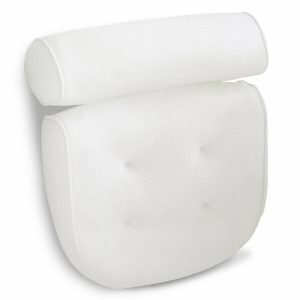 Whereas most tub pillows provide support to the upper back, neck, shoulders and head, this model from CostaCloud takes things up a level. This is a full body bath pillow which means that it supports your entire tailbone, taking off any kind of pressure from the back. You can sit and relax comfortably in the tub with this perfectly contouring full body bath tub and mat with no worries. For improved safety, this pillow is designed to resist mold and mildew growth. Its 3D mesh construction offers a quick drying feature which means that it won’t suffer from damage like other products. The bath pad is easy to clean and comes with a net washing bag to ensure that the cleaning process goes smoothly. 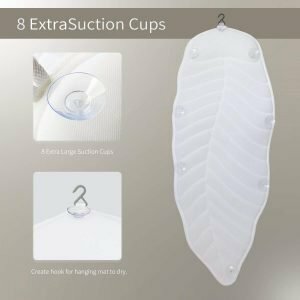 To keep the bath pad securely in place, there are 8 super grip suction cups that will stay put on any smooth surface. There is also a convenient built-in hanging hook for quick drying and storage. The manufacturers have engineered an environmental design giving the bath mat a unique leaf shape that cradles the entire body supportively. 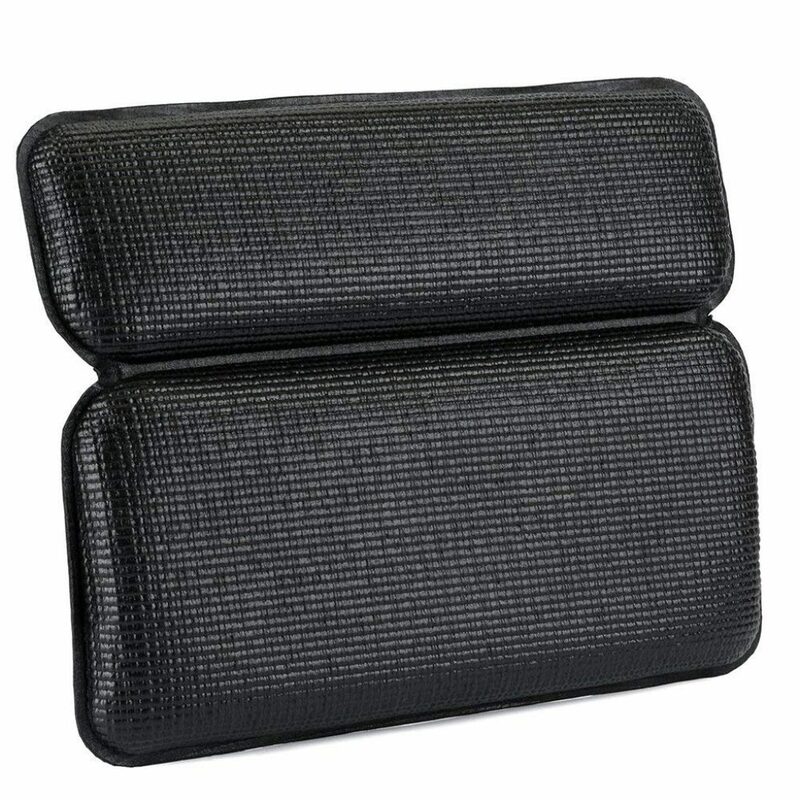 There is an extra thick 3 inch support of the pillow placed behind the head and a 2.3 inch thickness for the mat. Given its level of added support, this product makes the Best Full Body Bath Tub Pillow on our list. If you have a straight back tub, you really need to be careful about which bath pillow to use. This is a three panel bath pillow that will fit well into any bathtub. Featuring a uniquely designed grip, this piece will stay intact without slipping or moving in the tub. To guarantee a great grip, this pillow is outfitted with 7 suction cups as opposed to the usual 4 or 5 on other similar models. This gives it the added support it needs to comfort your back in a straight back tub. The pillow’s construction yields more than 2 inches of luxurious padded foam and three large panels with an orthopedic design. With its multi panel construction, you get optimal support for your head, neck and shoulders, along with the upper back. This unit is easy to clean by wiping down and will dry quickly with its nonporous and waterproof surface. This also enhances the pillow’s resistance to mold and mildew development. The suction cups on this pillow are removable to allow for a more thorough clean. Even though manufacturers claim that this piece will fit into any tub, this is an oversized piece so may not fit well in smaller tubs. Being a top brand in this category, Gorilla Grip backs their product with a solid 10 year refund guarantee which makes it the Best Bath Pillow for Straight Back Tub. 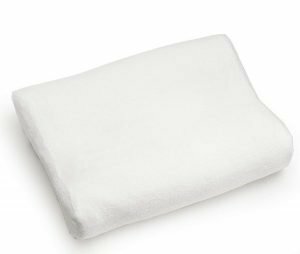 For a spa like experience right from the comfort of your home, this Posh Bath white bath pillow is an ideal choice. Featuring a no-fuss, easy to handle design, you get a two panel design to support your head and upper back with no slippage. The interior cushion is soft and durable while the material is chemical, mildew and mold resistant. 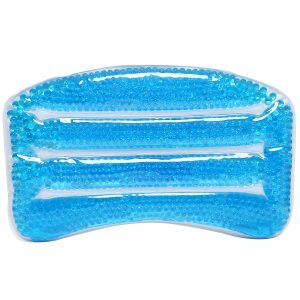 Designed ergonomically to keep your head, neck and shoulder supported, you can use this spa pillow in most types of tubs. This sturdy bath pillow can stand up to different water temperatures, handle various bath products and tackle the washing machine cycle as well. 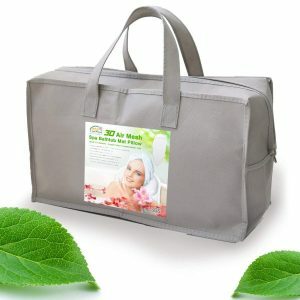 If you like to add in aroma theory oils, bath bubbles or any other products in your bath this pillow can handle it all. Its high quality construction holds up against most environments and will wash properly in the washing machine as well without giving in. So while this pillow may not be the most versatile on the list, it sure is one of the most durable. Based on positive customer reviews we nominate this as the Sturdiest Bath Pillow on this list. The only concerns, if any, voiced by some customers is the material being scratchy. The manufacturers support their product with a 100% money lifetime back guarantee which goes to say how much confidence they have in this bath pillow. This is an average sized bath pillow compared to its contemporaries, even small compared to others. In fact, it is sized to be packed easily when travelling. While multi panel pillows can become bulky to carry around, you won’t have any such issues with this bath headrest from IndulgeMe. Featuring a minimal design, this bath pillow is ultra-soft and comfortable. It offers a luxurious thickness of 4 inches to support the neck, head and shoulders. Its design components involve an orthopedic curve for maximum comfort and relief. This model uses large reliable suction cups to prevent any rude slipping as you relax in your bath. In addition you have an open air fiber design that allows air and moisture to flow through the pillow at all times. This prevents any mold or mildew risks and allows for fast and quick drying. This quick drying construction also makes it easier to clean and maintain. The cover on this unit is removable for easy washing. The IndulgeMe pillow is built to withstand wear and tear that comes with repeated use making it suitable to take with you wherever you go. It will stand well to any bangs and bumps it gets in the baggage and won’t break apart. This is why our experts call this the Best Portable Bath Pillow to take along with you. It comes with a carry case for easy transportation and you won’t have any trouble installing it in any type of bathtub given its basic design. Here is a bath cushion for adults on a budget. 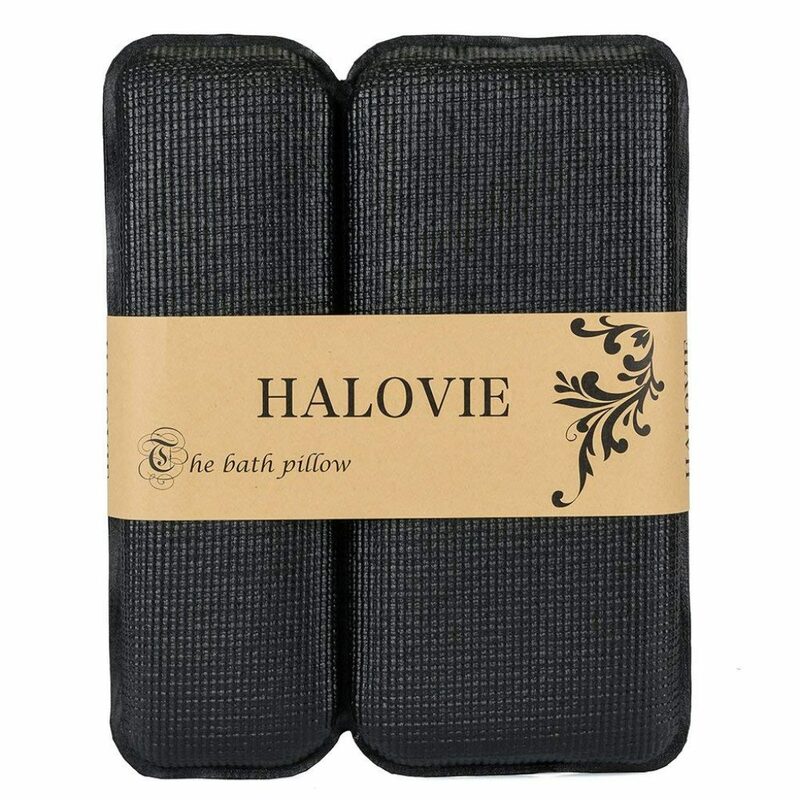 This HALOViE bath pillow is a no-slip bath accessory that will add levels of comfort and support to your experience. 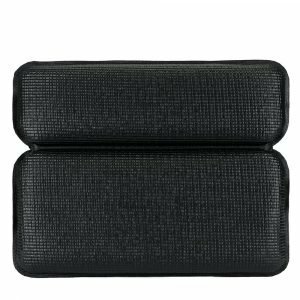 Featuring a dual panel design, the pillow sits just right to give your head, neck and shoulders the support it needs when resting against a hard ceramic bathtub wall. Competing with the best of the best, this bath pillow has 7 large suction cups to keep it steady after installation. It allows for easy mounting and supports the body with non-sliding action. 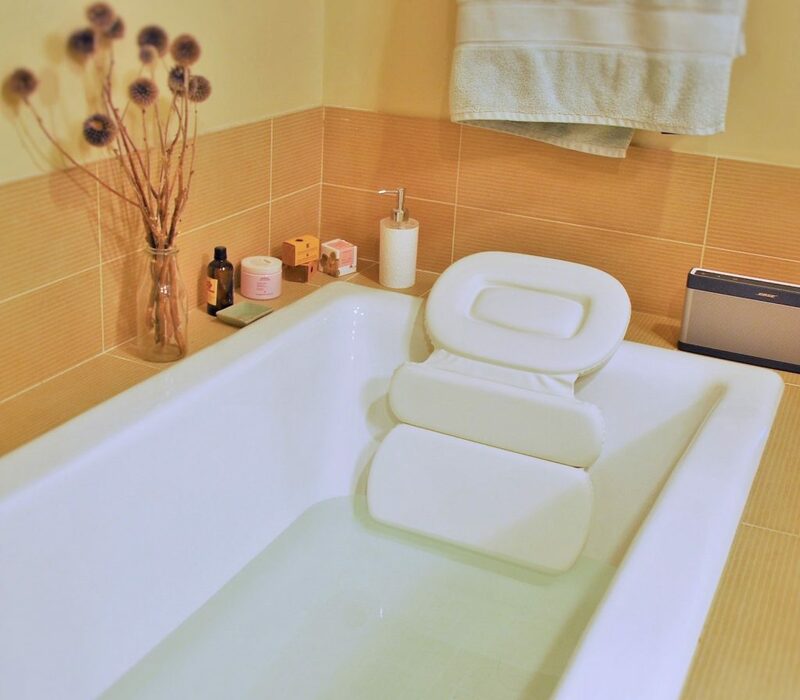 So you can spend longer in the bath without worrying about aches and pains, or sitting at awkward angles. Its design makes it installable in any kind of bathtub, keeping your upper body propped to a comfortable degree. The simple design also makes it easy to spot clean although it is not suitable for machine wash. The material is made to be odor and mildew resistant which adds to the hygiene and longevity of this piece. Despite being a lightweight unit, this bath pillow doesn’t compromise on quality. This is a low maintenance piece which will serve those people well who are not inclined to high maintenance bath accessories. 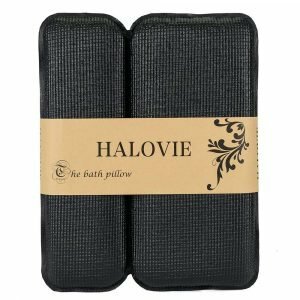 Combining all the right features at such an affordable price point makes the HALOViE bath pillow the Budget Pick on our list. 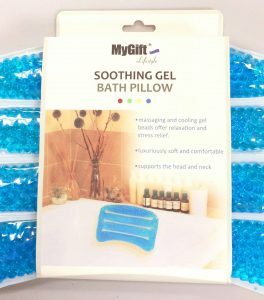 This is a gel infused bath pillow with tiny gel beads inside the cover. It features a fun and vibrant blue design. This flexible filling allows the pillow to contour perfectly with your upper body and head to yield exceptional support. The beaded filling allows for automatic adjustment to the shape of the head and neck. 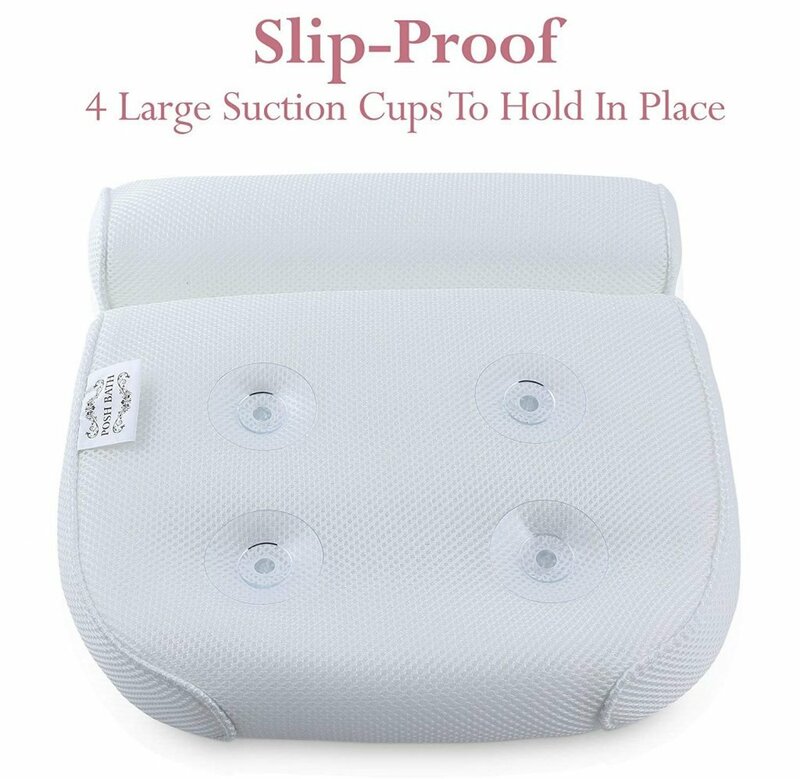 Secured with 3 suction cups, this bath pillow stays in place. It is a smooth and firm piece that is ideal for everyday use. With this type of filling you can even put the pillow in the freezer to cool it down before using it in the bath. The material used is waterproof, mold and mildew resistant. It is easy to clean and includes a multipurpose cleaning towel with the purchase. Given its clear see through surface, this pillow is not susceptible to discoloration even after extended use in water. It will stand well up to anything you might want to add into your bath such as bath oils or bath bubbles. Nothing will seep through the surface so there won’t be any concerns with odors or damp smells. Customers using this product feel satisfied with their purchase and applaud its comfortable support and cushioning. While most are happy with the level of grip the suctions cups offer, there have been some complaints about the suction cups being too flat and not sticking well. 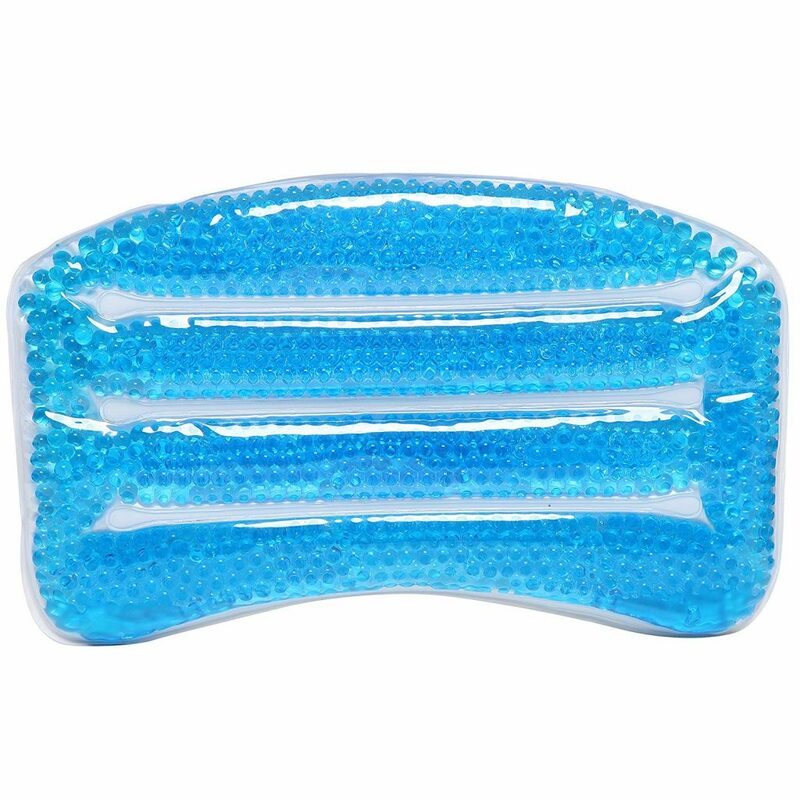 All in all, this ranks as a superior Gel Bath Pillow on the list. Shaped like a shell, this inflatable bath pillow will be the perfect addition to your relaxing bath experience. Made from heavy duty, high quality durable vinyl, this piece will resist wear and tear making it last for a long time. This piece is both air fillable as well as water, although there have been some issues trying to inflate it with air. Water inflation, on the other hand, has presented no problems, but some users feel that this might make the pillow scummy on the inside. The construction is also waterproof, mold and mildew resistant. Unlike other inflatable pillows that come with a fabric cover, this is all vinyl. There is no danger of absorbing unpleasant smells and odors after getting wet and the surface is easy to clean. When you feel it getting dirty or collecting grime, simply spray on some bathroom cleaner and you’re good to go. The pillow dries quickly and you can simply deflate it for convenient and compact storage. While it may not be a high end bath pillow to own, you can’t really complain given its very reasonable price point. Customers like that it serves the purpose well without costing too much and that is why it is our Best Inflatable Bath Pillow today. The best bath pillow will depend on your specific needs, so it’s important to take your time picking one. It’ll make the difference between a good bath and an at-home spa experience. A combination of warm temperature and the gentle pressure of water on the skin are a great way to relax. Add in a supportive bath pillow and you’re all set to repose. 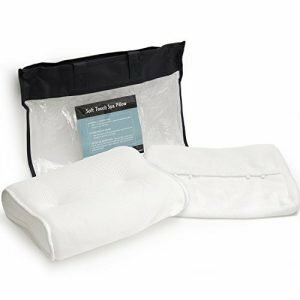 If you suffer from aches and pains, sore or tense muscles, or are simply stressed out, then the right bath pillow can soothe away these unpleasant sensations leaving you refreshed after your bath. Bathtubs come in an assortment of shapes and sizes. You have the classic roll top bath for a soothing, full-length immersion, or the bateau bath with its symmetrical sloping sides. Then there is the corner bath or an alcove tub shape to choose from. 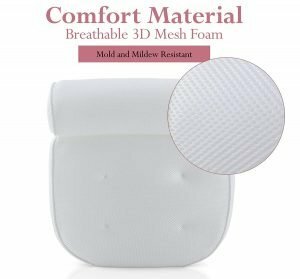 Without a proper fitting, you will find that instead of supporting your back and enhancing the relaxation, you’ll be slipping and constantly fixing the bath pillow. So when choosing a bath pillow, it is vital to keep in mind the size and shape of the actual bathtub you will be using. There are endless possibilities to gratify your bathing experience, most of which rely on your preference. You can choose from scented aromas and bath salts to placing lights around the bathtub. 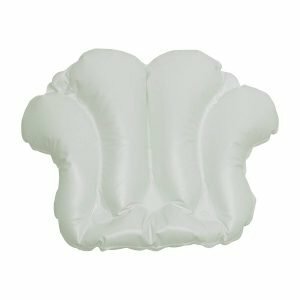 How to clean a bathtub cushion? Many pillows are machine washable which makes it easy to keep them clean. But if you must, you can use a simple solution of vinegar and baking soda to scrub away and remove mold, eliminating any spores as well. For hard-to-reach areas, use a toothbrush to scour the spores. Once you’re done, air dry the pillow or take it out to rest in the sun, eradicating the vinegar smell and any remaining spores. 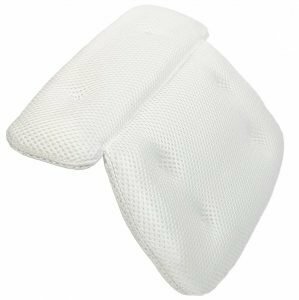 Designed to support your neck while negating the hard edge of the bathtub, a suitable bath pillow will fit in snugly to give you unbeatable comfort. 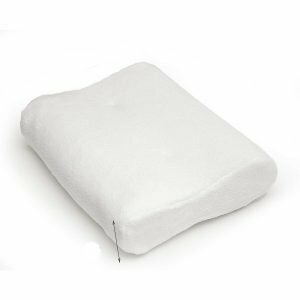 Here is what you need to look for in a quality bath pillow. There are different shapes and styles that you can purchase especially for the specific requirement you have. People sometimes only get pillows for luxury, while others find it a necessity because of strain or muscle cramps. You also have to consider the size of your actual bathtub. If the pillow is too small, you won’t be able to cover any side with it reducing the efficiency of the pillow. If it is too big and you can’t fit it properly into the bathtub, then what is the point of the pillow? High-quality materials used to craft a bath pillow makes it resilient and durable. As such, the material of your pillow must be waterproof and comfortable. Vinyl dries out easily and it is not uncomfortable to lie down on. 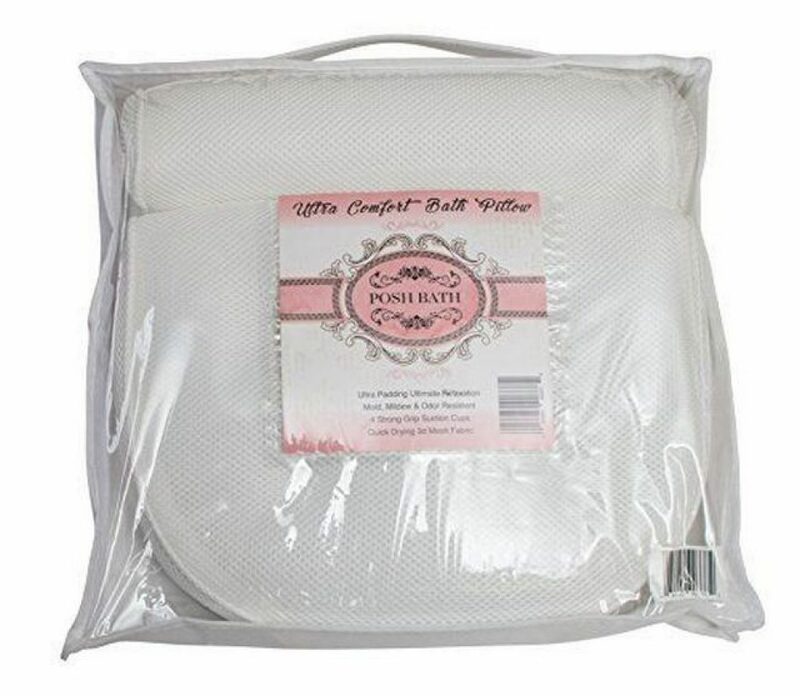 The pillow is sturdy and the material does not allow any mold or mildew to build upon it. Mesh layering is also beneficial as they allow for pressure to be applied on the pillow. Suction cups are a main factor to consider. If they aren’t strong enough to support you, your pillow will end up shifting and you won’t enjoy your bath. When looking at pillows, look at those that have two or more suction cups centrally placed so that not only will it stick, it will also support your weight when you lie down. The placement of the suction cups will also determine if the pillow will fit in your bath. If the place you want the pillow to fit into is curved, and the suction cups are too close to the center, then the sides of your pillow will flail around and annoy you while you bathe. The shape of the pillow relies entirely on the purpose of the pillow. Some pillows that may only be used for a neck support are better kept small and cylindrical. For those that need a back support, they should get a larger pillow with comforters, so that the whole back is covered. If you get a pillow for your back that does not reach the bottom of your bath, then there will be an imbalance between your upper and lower back, creating muscle issues. Just as well, supporting your whole back but not your neck will crane it, stretching the spinal bone connecting your neck. A good model is a multi-panel pillow such as the Gorilla Grip model featured here. A fast drying pillow will not only make your life easier, but it will also make it cleaner. If it dries off quickly, then you don’t have to worry about a damp smell left in your bathroom. You also don’t have to worry about the pillow becoming a perfect damp breeding ground for mold and mildew, the two main culprits for ruining perfectly good pillows. That is why pillows that have a mesh layering are recommended, so that the pillow can breathe and air dry, eliminating any mold spores. The QuiltedAir Bath Pillow and the Full Body Spa Bath Pillow Mat are excellent examples of 3D mesh technology. A waterproof material for your bath pillow is an important factor to your luxury. To have a waterproof pillow means that water can’t get into the stuffing and permanently waterlog your pillow. Have you ever lain on a wet mattress? It seeps out and flops, strained under your weight like a squash ball. That’s the feeling you’ll get from a wet pillow, which really reduces the purpose of the pillow to nothing. How well does a bath pillow support your head and neck? Good quality bath pillows help elevate your head and keep them at an angle that doesn’t strain. Some cushions even go far enough to pamper your back, giving it a soft surface to relax against. For the neck, it is kept upright and comfortable, making for a better relaxing bath. 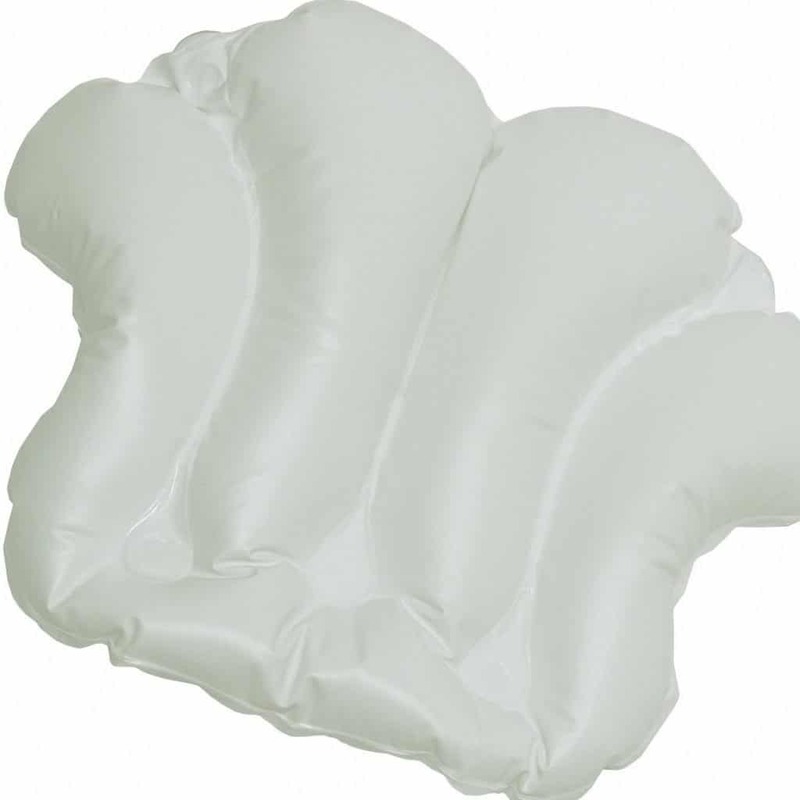 Inflatable pillows are filled with air and covered with waterproof material. They are quite easy to travel with and since they are filled with air, they are easier to snuggle into, as they are relatively flexible. 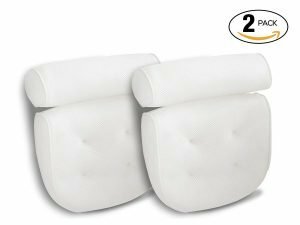 Gel-filled cushions, on the other hand, may be slightly stiffer, but they do provide adequate comfort and support to the user. They are sturdy and strong, amenable to different amounts of weight. Take a look at the MyGift Deluxe Bath Pillow if you’re considering a quality gel bath pillow. In the end, it depends entirely on the user, which they prefer as they each have different features to offer. 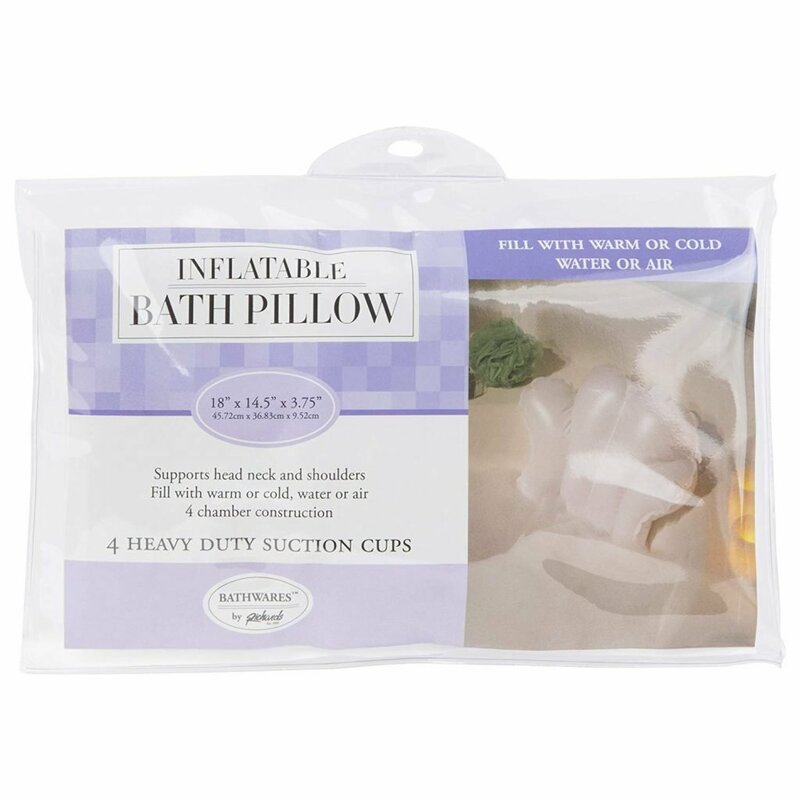 This is a must for all bath pillows since air and water don’t mix well when left unattended. When you have a wet or moist environment exposed to fresh air, or even worse damp air like that of a bathroom, then all kinds of germs find their way in. They thrive off of environments such as these and tend to spread around into the air afterward. Naturally, you don’t want to touch a pillow infested with bacteria, so it is important that your pillow has antibacterial material. 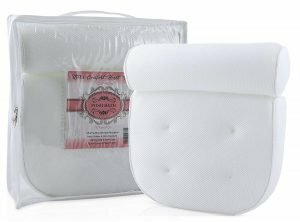 Since there are hygiene and health issues related to bath pillows, it is best to get something that comes with a guarantee. That way you can return it if you’re not satisfied. Top brands such as gorilla grip offer a 10-year refund guarantee while others like Posh Bath promise lifetime money-back guarantee. 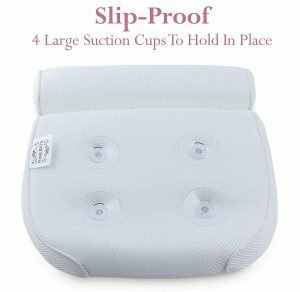 What are the medical precautions on using bathtub pillows? Typically, bath pillows have health related benefits. They can help your back and neck posture. What can cause issues is the grip of the suction cups. If they aren’t strong enough to support you, then you could slip and seriously hurt yourself. These suction cups are meant to withstand your entire weight. 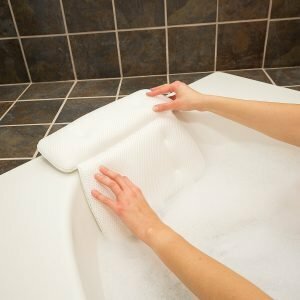 How long does a bath cushion serve before it has to be changed? This will depend on the frequency of use. 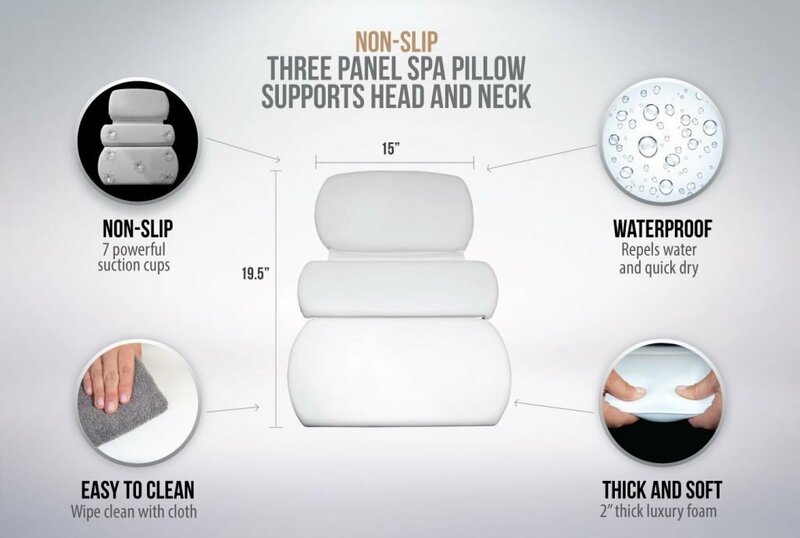 Most bath pillows are designed to last a few years but if suction cups start to come off, or the unit develops odor issues, it’s time to get a new one. 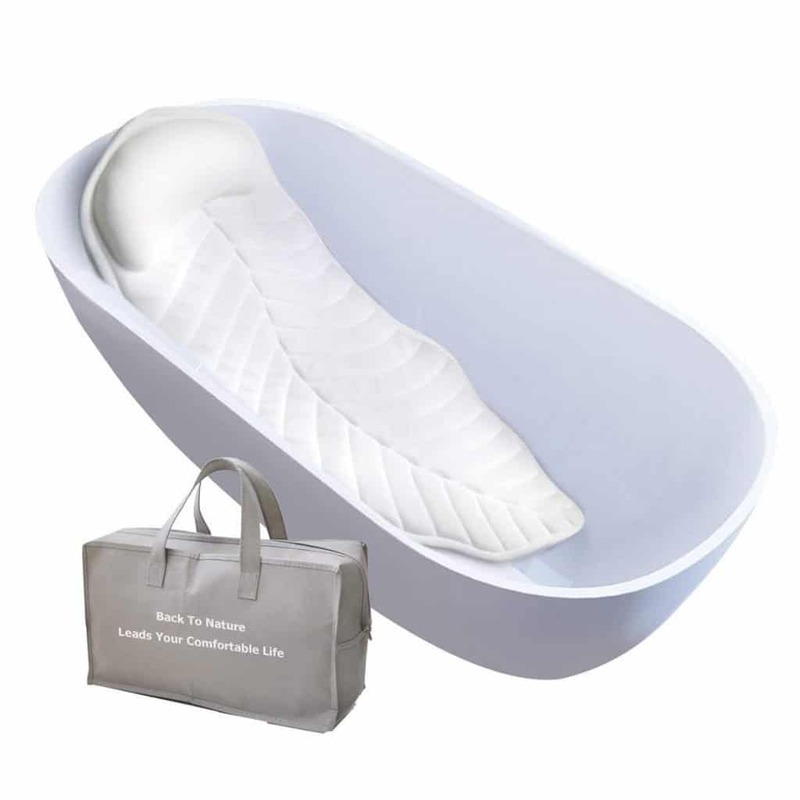 Can children use a tub pillow? There are bath pillows made especially for both babies and children. They are not as large as normal sized bath pillows and do not strain your child’s neck. They come in designs appealing to children and are sturdy enough to take some child’s play. 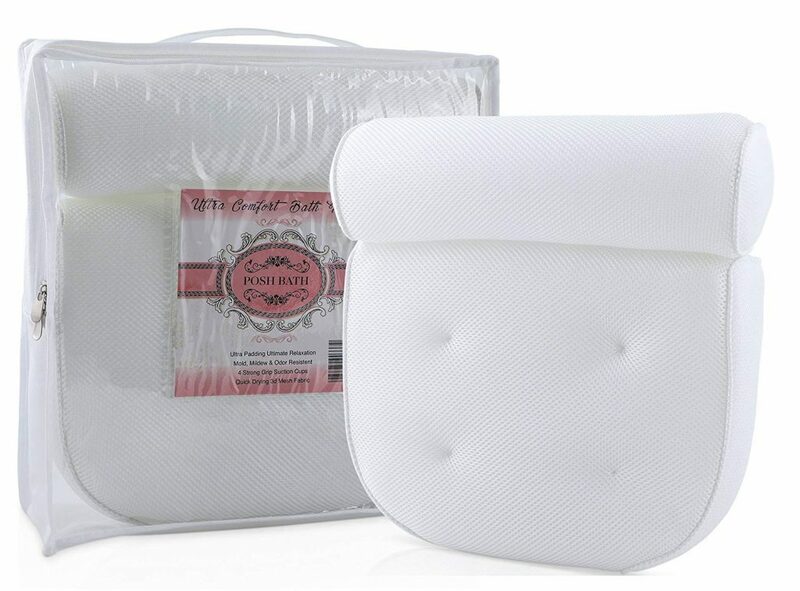 To get the most ergonomic experience from your bath we highly recommend the QuiltedAir Bath Pillow. It has all the necessary features to indulge in a de-stressing bath, all in the comfort of your home. 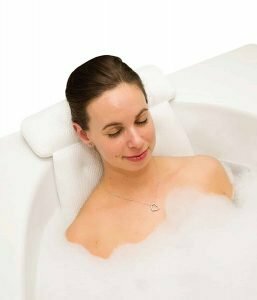 Or if you want to create the ultimate spa experience at home then look no further than the Viventive bundle with its bath pillow and caddy tray together. You get all the indulgences of a professional spa at a fraction of the cost and however many times you want. But if you are looking for something that will provide support to your entire back then a full body pillow is what you should invest in. 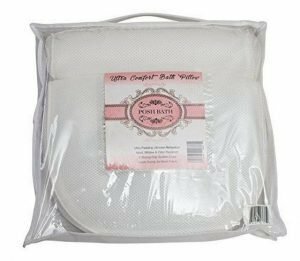 For us, the best bath pillow in this category happens to be the Full Body Spa Bath Pillow Mat from CostaCloud. All these are excellent choices to go for to enjoy a restful soak at home.